Bus service to the island was actually discontinued for a short period in 1988, after DDOT officials announced in June of 1988 that it planned to overhaul its bus system. One of the major changes proposed included operating the Belle Isle bus line only from April 1 through Labor Day. On Tuesday, Sept. 6, 1988 — the day following Labor Day — senior citizens, who used the bus route to get to a senior center in the park's casino, along with employees who worked at the park, were caught by surprise when they discovered the bus service had been discontinued. By Thursday, angry city council members demanded that the route be reinstated. On Friday, Sept. 9, 1988, bus service was restored to the island after DDOT officials decided that there was a need for the service after all. Shortly thereafter, in 1989, DDOT combined its Route #4 Belle Isle with its Route #12 Conant, and service to Belle Isle became a branch extension of the Conant bus line. After thirty-eight years of operation as a stand alone bus route, service to the Island would once again be provided as an extension of another bus route. Conant service across the island operated only on weekdays — from around 8:30 a.m. to 5:30 p.m. Although trips during peak hours would continue around the island, most trips would short-turn at the Belle Isle Casino. A few route adjustments — including coaches continuing along Riverbank Drive (instead of Central) to the bridge — were also made under DDOT. During the later years, service headways would increase to 40 minutes during peak hours, and up to an hour during off-peak hours. Click here to return to the "BUS ROUTE HISTORY" Main Page. Belle Isle is a 2½ mile-long, one-half mile wide, 983-acre island park that's located right in the middle of the Detroit River. The island lies just to the east of downtown Detroit, between the United States mainland and Canada. To the original Chippewa and Ottawa Native Americans, the island we know today as Belle Isle was known as Wah-na-be-zee (Swan Island), but to the early French settlers, who used the island to house their pigs and chickens to protect them from coyotes on the mainland, it was known as Ile au Cochons (Hog Island). Ownership of the island changed hands over the years after the arrival of the French, but was eventually purchased by Barnabus Campau (son of Joseph Campau) in 1817 for $5,000. 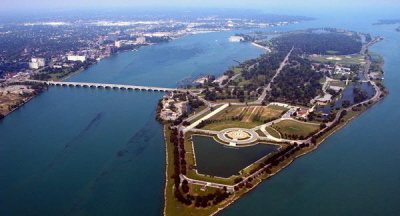 In 1845, Barnabus Campau renamed the island "Belle Isle" (French for "Beautiful Island"). Rumor has it that he named it in honor of Isabelle Cass, daughter of Michigan territorial governor, and later U.S. Senator, Lewis Cass. In 1879, the City of Detroit purchased the island from the descendants of Barnabus Campau for nearly $200,000, as part of a "Beautify Detroit" initiative that began in 1876. Local planners wanted the island to complement the construction of a proposed 11.3-mile peripheral boulevard, originally intended to run through open country circling the edge of the city. In 1884, construction of that "Grand Boulevard" would begin, which would run from the entrance of Belle Isle at E. Jefferson to River Road (W. Jefferson) on the west side. The city's newly acquired island was "officially" named "Belle Isle Park" by a Detroit Common Council ordinance on Aug. 29, 1881. During the 1880s, the island was designed into a park by Frederick Law Olmstead, the same designer who designed Central Park in New York City. It was during this period between 1884 and 1908 when the island saw the development of most of its roads, bridges, lakes, shelters, and plantings. Belle Isle would soon become Detroit's first major city park. The island opened to the public in 1884. In 1889, a wooden bridge was constructed that connected the island to the city's mainland. However, that first bridge was accidentally destroyed by a fire on April 27, 1915, and was replaced the next year by a temporary bridge built just to the west. A new 2,193 foot long concrete and steel arch designed bridge — located at the foot of East Grand Blvd. — was constructed at a cost of $2,635,000. The nearly one-half mile long bridge opened on Sept. 1, 1923. Known originally as the Belle Isle Bridge, it was renamed the "Douglas MacArthur Bridge" in 1942, in honor of U.S. Army General Douglas MacArthur. Originally, streetcar service to the island had been planned by city officials, with 2,159 feet of double streetcar track built into the pavement along the east side of the newly constructed bridge. The city also built a Roman motif style streetcar waiting station near the entrance to the bridge. However, the streetcars were never implemented, and the unused rails built into the bridge remained exposed until eventually paved-over during the early 1950s. The city's streetcar loading station instead became known as the Belle Isle Coach Station. On Jan. 1, 1925, the DSR's Motor Coach Division began operations, and shortly thereafter — beginning Sunday, Feb. 1, 1925 — the DSR began using its own coaches on Belle Isle. During the early years, service operated under a 10 minute headway and traveled primarily along Central Avenue to the east end of the island and back. However, according to an official DSR 1926 route map, the DSR also provided express bus service to Belle Isle on Sundays and Holidays. The route operated from Woodward and Adams downtown via Washington Blvd., Michigan Ave., Cadillac Sq., Congress, Mt. Elliott, Lafayette, E. Grand Blvd., across the bridge and around the outer Drive of the island. This service appears to have been short-lived and disappeared by the end of the decade. On June 26, 1938, the Belle Isle bus line became a branch extension of the East Grand Boulevard (Boulevard) bus line — a former Detroit Motorbus Company bus route that operated from E. Grand Blvd. and E. Jefferson to W. Grand Blvd. and Second. Service remained a branch of the East Grand Boulevard route until the Boulevard line was combined with the Grand Belt bus line on June 22, 1950. Once again the Belle Isle line would become a separate bus route. It then followed along a route around the island that would remain intact for nearly forty years. During its heyday, the Belle Isle bus line operated under 30 minute headways during most hours of the day. Bus service to the Island was provided seven days a week, operating from 6:30 a.m. until the last coach would leave for the island at 12:00 midnight — every night, including Sundays. But by the time DDOT took over operations in 1974 the service hours had already been reduced. Although the headways remained at 30 minutes, the last coach now left the island at 6:30 p.m.
from the mid-1960's, click-on the Belle Isle transfer ticket pictured on the right. magazine articles "Detroit's DSR, Parts 1-3" and Images of Rail "Detroit's Street Railways" by Ken Schramm; and local Detroit newspaper articles. Did you know that portions of Belle Isle were actually man-made? which was completed in 1925, sits upon one of these man-made land base areas. route that traveled to Belle Isle was discontinued. Nearly 100 years of bus service to the island had come to an end. when it provided bus service on Belle Isle between 1909 and 1924. The Belle Isle bus line was the oldest motor bus route in the city. Although the streetcar service planned for Belle Isle never materialized, bus service across the bridge to the Belle Isle Casino began as far back as the early 1900s. In 1909, the Detroit Department of Parks and Boulevards began providing bus service to the island. Although primarily intended for the park employees, the public also utilized the service. Ticket prices were 1¢ each and were sold in books of fifty. For the most part, a fleet of eight 32-passenger "open-sided" Packard buses were used to operate the service. However, two standby 65-passenger Packard semi-trailers were available for busy days. On June 11, 1924, the city-owned Department of Street Railways (DSR) took over the operation of the Parks and Boulevards' buses — extending the service to the east end of the island. Although DSR employees operated the buses, Parks and Boulevards furnished the garage and continued to fuel and maintain the fleet. They also charged the DSR 12¢ a mile for the use of its buses.